Square of book muslin edged with lace insertion with butterfly design. 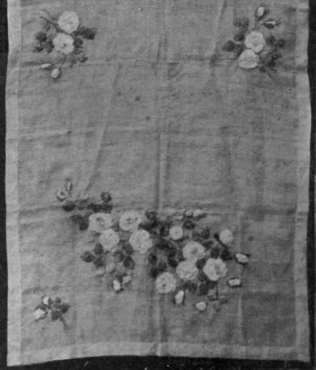 Sweet-peas with their own foliage are painted on the muslin their particular environment. , Blue, by some, is declared to exercise a depressing effect, whilst green is said to possess a curiously restful influence. Pink, on the other hand, would appear to others to have the. happy faculty of raising the spirits to such a point of exuberance that the dullest dinner-party becomes an amusing function. Perhaps there is more truth in these theories than would at first appear, for from childhood have we not heard of the magic of "rose-coloured spectacles"? However, perhaps it is a point worthy of note by the hostess who aspires to social success that she may select a good colour scheme for her table decorations. Already many hostesses prefer one general scheme of colour for the decoration of the hospitable board. Flowers, candle-shades, and the table-centre, even the menu-holders, blend and assimilate in perfect harmony of tone and colouring, and, when the idea is carried out well, it must be acknowledged that the effect is a decidedly beautiful one. For such a colour scheme a vivid rose is undoubtedly a good choice. There are so many exquisite flowers, which seem to run riot in the entire gamut of rose and crimson, that one cannot do better than follow the wonders of Nature's art when thinking out an artistic scheme, and keep to her handiwork as closely as possible. We strive for the ideal in colour. For instance. sweet-peas are now grown in marvellous shades of rose. They are admittedly unrivalled as floral decorations for the table. Therefore., follow out their variations of colouring for your pink table-centre. 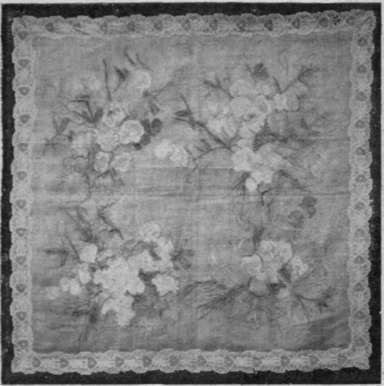 Pale yellow poppies painted on fine muslin, which is edged with Valenciennes insertion. 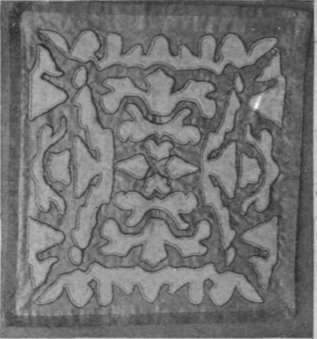 Round .able-centres are much used embroidered parallel. This gives a pretty chequered design. The same idea can be worked out successfully in two shades of mauve, green, or yellow; but the palm must be given to the rose-coloured scheme. Another beautiful idea is to work a fairly wide ribbon on to a white muslin table-centre. For this take a shaded rose-pink ribbon, and work it rather loosely into large roses, which look very exquisite, as they have a raised effect, and give the impression of the actual growing flowers. The leaves are worked in shaded green ribbon. Embroider the stems in the chain-stitch, which is worked by taking a stitch down, and, before the needle is brought out of the muslin, bringing the filoselle forward under the point of the needle. Muslin is really a very beautiful fabric for making into table-centres, it being so delicate and transparent. Muslin is also particularly beautiful when paint and brushes are used in the place of needle and silk. Round dinner-tables are so much in request that it is well to discuss the possibilities of round table-centres. A very pretty one was made of fine muslin, edged with a dainty Valenciennes insertion in a circular medallion design. Very pale yellow poppies had been painted on to this in water-colours, and real poppies were scattered in masses around the table-centre. 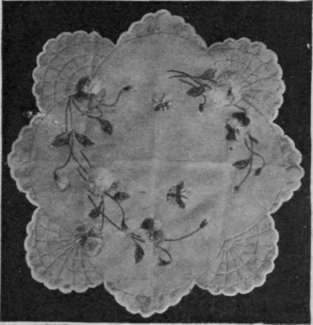 Another hand-painted muslin table-centre was made of a square piece of book muslin, bordered with an exquisitely fine lace insertion of a light butterfly design. Sweet-peas in their, natural colours were painted in masses over the entire fabric, and the effect was certainly very charming. For those who prefer embroidered transparent table-centres, gauze presents unlimited charms. It must, however, be mentioned that embroidery on gauze tries the patience of even the skilful needlewoman. But, as may be imagined from its fairy-like qualities, the result more than compensates one for all the trouble which has been expended. A bold design of nasturtiums embroidered in satin-stitch, in their own colouring, requires a very formidable rival to equal it for originality and beauty. Nasturtium leaves and their tendrils also lend themselves perfectly to an artistic decorative scheme for embroidery. Pansies, too, worked in soft velvety shades of mauve, look wonderfully well on gauze. The gauze table-centre should be finished off with a buttonhole-stitch all around. Choose for this an ivory shade of filoselle. Lace insertion does not seem to lend itself to gauze so perfectly as it does to muslin. Pansies worked in soft shades of mauve. Finish the gauze with buttonhole-stitching in ivorv filoselle another point in their favour for everyday use is the fact that they wash so well. Care should be taken that "washing" silks with "fast" colours are used for their embellishment. A very pretty idea for a linen table-centre is a design of large butterflies, worked in satin-stitch in various soft colourings. 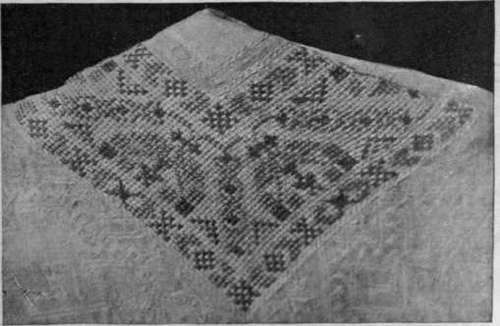 When the embroidery is completed, the linen at the outside is cut neatly away from the butterflies with a sharp pair of scissors. The butter-then rest on the delicate white napery of the tablecloth in a charmingly effective manner. A quaint effect obtained by cutting out green satin in a fantastic design and laying it over a white satin background. 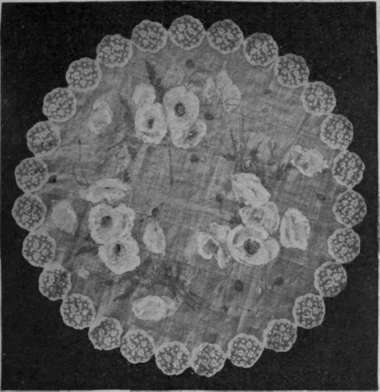 The edges must be finished with satin-stitch in black, and the square edges with gold braid table-centre should be finished off with a good dull gold braid, about an inch wide. It can be made more elaborate by working Japanese characters upon it. if desired; but it is a fine piece of work without this addition. Lace table - Centres are also useful. They are very effective made of braid lace. One very beautiful specimen was composed of exquisitely fine Irish crochet. This table-centre had a set of dessert d'oyleys of Irish crochet en suite. There is a great charm about lace table-centres, so filmy and dainty are they; whilst their appearance can be constantly varied by laying them over satin of various colours. The charms of artistic table-centres are indeed diverse, and they allow of ample choice. A fascinating field of exploration lies before those who desire to become collectors of these charming adjuncts for the glorification of the modern dinner-table.